Benjamin Scheuer takes his life story out on the road. 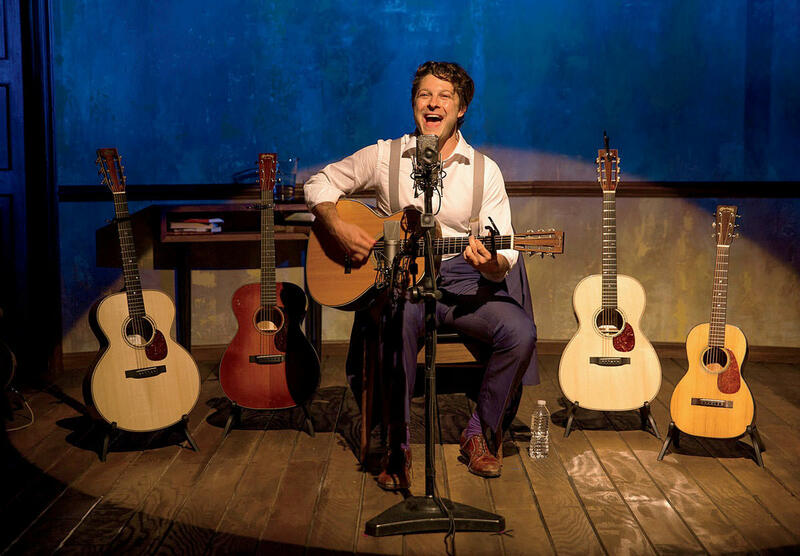 The only props in The Lion, the critically acclaimed musical by Benjamin Scheuer ’04, are the chair he sits on and six gorgeous guitars. Among them, there’s a gentle 1929 Martin, an electric Gibson that growls, and a stylin’ Froggy Bottom H-12, which Scheuer got as a thirtieth birthday present. But the two most important instruments Scheuer has ever played are not on stage with him. The first is a toy banjo that his lawyer father made for him out of the lid of a cookie tin, some rubber bands, and an old necktie for the strap. Scheuer played it alongside his father on the front porch, mimicking his finger strokes. The second instrument is the guitar his father played, which the teenage Scheuer inherited after a sudden brain aneurysm killed his father and sent his world into chaos. On stage, Scheuer sports a wide boyish grin, a well-tailored suit, and floppy hair. He both charms and disarms the audience with his intensely personal story (told while transitioning among the six guitars). Born as a few songs the New York singer-songwriter had strung together while playing Greenwich Village coffeehouses and bars, The Lion, now a 70-minute solo show, has been praised by The New York Times and the Huffington Post, and has won London’s Offie Award for Best New Musical. Scheuer, The Boston Globe wrote, “...can pluck the audience’s heartstrings as skillfully as he does his guitar.” The show, which had earlier runs off-Broadway and at the Edinburgh Fringe Festival, began a one-year, five-city tour in August at the Merrimack Repertory Theatre in Lowell, Massachusetts, before traveling to Milwaukee, Rochester, Washington D.C., and Pittsburgh. The animated music videos for two of its songs have won prizes at the Annecy Film Festival, The Crystal Palace Festival, and the British Animation Awards. Playing himself at age 14 in another scene, Scheuer expresses his anger at not being allowed to attend a much-anticipated band trip to Washington, D.C., because of a poor grade in math. In response, the teen pins a note to his father’s door, calling him “the kind of man that I don’t want to play music with, the kind of man that I don’t want to be.” Scheuer and his father didn’t speak for more than a week—and before they could reconcile, his father died. The show also chronicles other major life events, like the first time Scheuer fell in love, and his diagnosis of stage IV Hodgkin’s lymphoma in 2011. In song, he narrates the process of enduring chemotherapy treatments, and the subsequent weight gain, hair loss, depression—and ultimately, a new outlook on life. Ensemble members reminisce in Party People, about the Black Panthers and Young Lords.